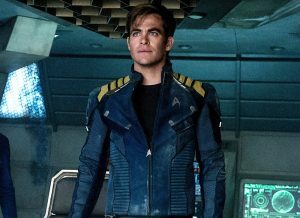 Please note: this review contains heavy, heavy spoilers about the plot of 2016’s Star Trek Beyond, which you should certainly watch before reading this article. 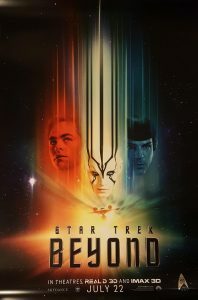 Let’s start by getting this out of the way: Star Trek Beyond is probably the best reboot Trek film, and honestly, no one’s more surprised than me. By all rights, the combination of Simon Pegg at the keyboard and Justin Lin at the camera shouldn’t have worked, since Trek is supposed to be neither a dark absurdist comedy nor a racing film with thready character development. But they’re actually trekking and exploring strange new worlds; they’re getting into action-packed scenarios without losing the heady “big sci-fi” that Trek is supposed to be; they’re investing in relationships and putting Kirk, Spock, and McCoy in interesting situations; and they’re giving the story weight without melodrama. Or maybe with the right melodrama. Either way, it’s excellent; and not just because of the story. The characters really work well together, especially the interplay between our series leads, the film’s new alien sidekick, and the mysterious bad dude Krall. And it’s their interaction that I think really sells the film. At the (warp) core of the Federation’s doctrine is the Prime Directive, a law which prohibits the Federation from interfering with other planets and cultures before they’re ready. But its purpose isn’t mere stewardship; understood with the integrated nature of Federation crews, the Prime Directive is an understanding that unity among diversity is the Federation’s greatest strength. The Prime Directive is an understanding that unity among diversity is the Federation’s greatest strength. 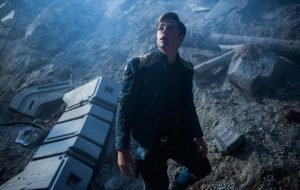 Star Trek Beyond calls that into question with a villain who has decided that unity is weakness, an outsider who has discovered her true need for others, and in the middle, Captain Kirk – historically, not a paragon of the Prime Directive; and in this film, a doubting Thomas. Doubt gets a bad rap in the church. Which is odd, because we really like children, and kids are practically BORN asking why. My son is a little scientist, doing experiments over and over, trying to collect more data…and seeking to prove things. But when we grow up, this ceases to be cute and becomes annoying. Somewhere along the way, we got the idea that doubt was bad, when really, doubt is just inconvenient. For our parents, for our pastors. And sure, it’s annoying to explain to a child for the fifteenth time why they can’t have cookies before dinner. But it could be that we don’t look down on doubt for any good reason, but because it’s tough to give answers to hard questions. It’s possible that the church has called doubt a sin because it’s difficult to answer questions, and easier to say “because that’s what we’ve always taught” than to research our beliefs and make sure that they’re Biblical. Doubt is difficult. Doubt is difficult. But not for God. He can take it. And God not only tolerates our doubt, He welcomes it. But not for God. He can take it. And God not only tolerates our doubt, He welcomes it. The Bible shows God’s people expressing doubt over and over. And, of course, the example of doubt in the Bible that’s so well-known it has entered our lexicon. And for that brief interaction, he’s been saddled with the nickname “Doubting Thomas” ever since. He’s been looked down upon. He’s been used as a whipping boy to get people to believe blindly. But I think he should be honored. That’s right, I said honored. Let’s look back at the other examples above. The Psalms mentioned above aren’t just sadly doubting God, they’re taking their concerns to Him. “God, are you who you say you are? Are you actually hiding from me?” To which God joyfully replies, “No, that’s not who I am.” A reply that isn’t just said; it’s proven. God answers their doubts by proving who He is; sometimes individually, and sometimes in huge ways. Elijah, who was mourning the loss of other believers in Israel, is given the opportunity to train another, his successor Elisha; the people of Israel are restored to their city and allowed to rebuild; David is reminded of how close God truly is. Asaph’s situation in Psalm 77 isn’t changed dramatically, but he has seen God in a different way by the end of the Psalm, and his heart is calmed. In the doubts God highlights in His word, He shows that He delights in revealing Himself through our questions and wiping away our doubts with the truth of His reality. “Taste and see that the Lord is good,” He says through David; David, who has had his doubts answered again and again, and tasted that the Lord is good again and again. And so, when Thomas begged for proof from Jesus, I think his Savior was pleased. Pleased to be able to prove who He was in a big way: a God of life over whom death has no power. When Thomas begged for proof from Jesus, I think his Savior was pleased. “But David,” I hear you say, “Didn’t Jesus rebuke Thomas for his doubt?” It certainly seems that way: “blessed are those who have not seen and yet believe,” he says. But I don’t think He was rebuking Thomas for his doubt. I think His rebuke was pointed at the fact that Thomas had missed all of the other proof Jesus had shown in the previous three years; the water He had walked on, the friend raised from the dead, the water turned to wine. Jesus welcomed his doubts, but the proof that He was a God with power over death started long before He rose from death. And although Jesus was sad that Thomas had missed all the signs, He still offered more proof. “See my hands and feet?” He said, echoing Thomas’ own words just eight days before. And in the very next verse, He commissioned John to write more about Him so that others could believe. Jesus loves to answer the skeptics, and to show us who He really is. Jesus knows that doubt deepens our faith by shaking it down, by letting us get closer to the real Him, rather than the false vision of Him we have. And so I think Thomas should be revered for his boldness, because he was doing what God’s people had always done: boldly, but honestly and respectfully, asking God who He is. So what does that have to do with Trek? In Kirk’s Captain’s Log at the beginning of the film, he admits to being a bit burnt out on space exploration. Things are starting to feel “episodic,” he says. He’s losing his faith in the mission of the Federation, of finding new worlds and new life. 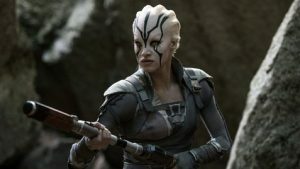 And then, after his ship is destroyed and his crew captured, he meets Jaylah and Krall. One shows him that he needs his crew and his mission; the other calls the Federation a sickness that needs to be destroyed. And Kirk stands before this mission, demanding that the Federation and its doctrine prove their worth. Which, of course, they do. So go to God. Humbly but boldly tell Him what your doubts are. And learn who He really is- in ways you’d never expect. Thank you for reading Redeeming Culture! This entry was posted in Sci-Fi and tagged doubt, power trio, Star Trek, star trek beyond. Bookmark the permalink.